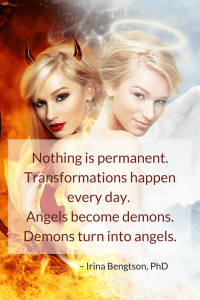 Do you think an abusive narcissist can transform into a loving, caring mother when you thought she was lost forever in the fog of dementia? Is there any point in long-term suffering? 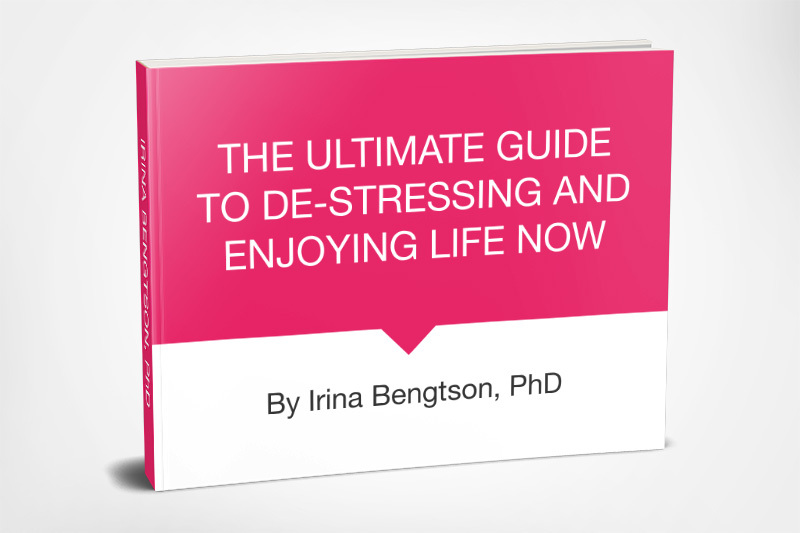 Read my story and decide for yourself. My mother was a tyrant who lived atop a pedestal of her self-proclaimed greatness. She was negligent of other’s feelings and ignorant of their thoughts, prizing no one but herself. There were no hugs, no kisses, no “I love you, sweethearts.” She was always moody, angry, and restless. Blaming, criticizing, and complaining. My safest place on earth–our home–wasn’t safe, but it was the only place I had. Each time I returned home, there was more pain. For many years, there were only pain and hatred left. It’s different now when most of it is gone–Mom, our home, and my hate. I found forgiveness, compassion, and love but the residue of pain will probably never go away. I peeked into the sunlit room. Mom was standing there unsteadily looking down at her feet. She seemed uncertain of what to do next, or what she was even doing there in the first place. I moved closer and held out my hands. She slowly lifted her head and looked at me. The blank expression on her face fled and her faded grey eyes gleamed anew with life as if someone had set a spark to a pair of dead stars. A bright, childish smile transformed her wrinkled face so that it looked open and warm. She looked so fragile in this shrunken body I could barely recognize her. The thin arms within the oversized skin. The bluish hands with trembling fingers, crooked and stiff with arthritis, but surprisingly strong. The shaky legs that seemed to have a mind of their own. Her once rich head of bluish-grey hair she was so proud of was gone, too. A bit of ashen fluff barely covered her skull. I looked intensely into mom’s eyes, soaking up the kindness and love. It was an overwhelming but amazing feeling I wasn’t used to. “Is it another trick of hers?” A needle of doubt pricked my heart but soon vanished. Mom’s entire being was shining from the inside–it was the real her that had been hidden somewhere in the dark since she was little. See the best in people. 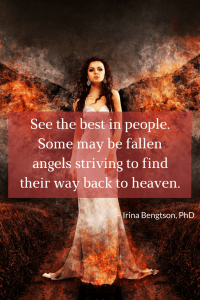 Some may be fallen angels striving to find their way back to heaven. I came closer and hugged her carefully as I would hug a baby. Mom hugged me back. We were standing there for a while breathing shallowly so as not to frighten off that rare moment of joined joy. My visit was drawing to a close. Mom and I spent every possible moment holding hands and looking into each other’s eyes, more communicating than talking. Mom couldn’t say much–the dementia had disassembled her brain and turned it into a mass of lipid cells barely hanging together. Then suddenly: “How old am I, baby Bee?” she asked. “Time flies.” She closed her eyes, lost to the world. Sometimes she would become agitated and walk back and forth at her best speed–once restless, always restless. Then, exhausted, she would sit on a chair, but an invisible power would push her back to her legs. She would apologize and start walking again. A year earlier it would have driven me nuts. Now I felt her suffering and my heart cried for her. Only when we allow ourselves to recognize and feel other people’s pain can we become human again. We walked together and I let her lean on me for support. I tried to make our rounds more adventurous. Finally, her last bit of strength would leave and she would fall into a brief sleep. Sitting on the side of her bed, I would stroke her hand and sing her a lullaby, the same she used to sing for me when I was little. One day, mom fell asleep in my old room. As I gazed through the window, memories flashed through my mind. When I looked back at her, she was awake and smiling. “An angel came to me,” she said with an unusual calmness in her voice. “Tell me about the angel,” I begged. “He had a kind face and a strong body,” mom shared, a little shyly. I was leaving the very next day, and I was nervous about mom’s reaction–I didn’t want to upset her. “Don’t leave me. Stay,” she pleaded. “Do you feel me close sometimes, even if I’m not around?” I looked at Mom’s saddened eyes. “I love you too,”– soulful and sincere. Feelings of relief, forgiveness, and gratitude clouded my eyes with tears and filled my heart with warmth and uncomplicated love. Not to disturb mom, I turned away to spread the blanket over her feet. I called from the airport, and Mom’s nurse answered the phone. Sitting on the plane, I was thinking about Mom’s angel. Mom’s sudden change meant the world to me – I finally knew that she loved me and that she always had in her own way. I wanted her to find peace in that troubled mind, relief for her tired body, and freedom for her imprisoned soul. I wished her to leave for the better world. And I wanted her to stay a bit longer with me, now that I had finally found her. Was it a profound, real change? I believe so. For both of us. Sometimes, a person’s true face shows up for the first time in her last act. Mom could finally reconnect with her true self. 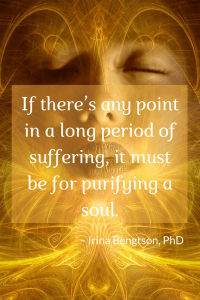 If there’s any point in a long period of suffering, it must be for purifying a soul. In this case, it was for both of us. I could forgive her after so many years of pain, and Mom’s unexpectedly resurfaced love helped me with that. I used to want her to be in Hell, but I don’t want that anymore. I believe she suffered enough. She passed away a few months later, and I was there to say goodbye. I love you, Mom. Be my angel now. 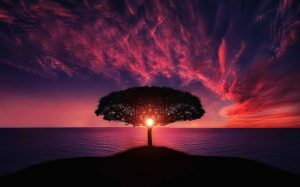 This article was first published on Purpose Fairy under the title: Dementia: Bringing an Unexpected Gift of Love. Yesterday I was catching a tail of one last summer-like day. Together with my husband and friends, we turned a deserted spot of thicket into a promising little garden. Plants, freshly introduced to their homes, seemed to see themselves around acknowledging new neighbors and willingly taking roots in their new beds. Soon they will be ready for the winter. Then Spring will magically transform them into a kaleidoscope of colors and smells – a new paradise for bumblebees, butterflies, and birds. And for the rest of a crawling and flying crowd that owns the Earth. At the end of the day, exhausted, I fell on my bed and was instantly beamed into another reality. In that transitional world, between wakefulness and sleep, I had a conversation with Mom-the most difficult person to love, I ever knew. She was somewhere above, her voice calm and soft. That was the first time I felt her presence since she passed away a year ago. And that was the best conversation we’ve ever had. Mom knew about my doubts, sorrows, and regrets. She was kind and supportive saying that I shouldn’t doubt myself. That I did my best and I must live my own life. I don’t remember the exact words but that was LOVE talking.